Here’s a fun Halloween DIY toy that kids from toddlers to teens are sure to love! 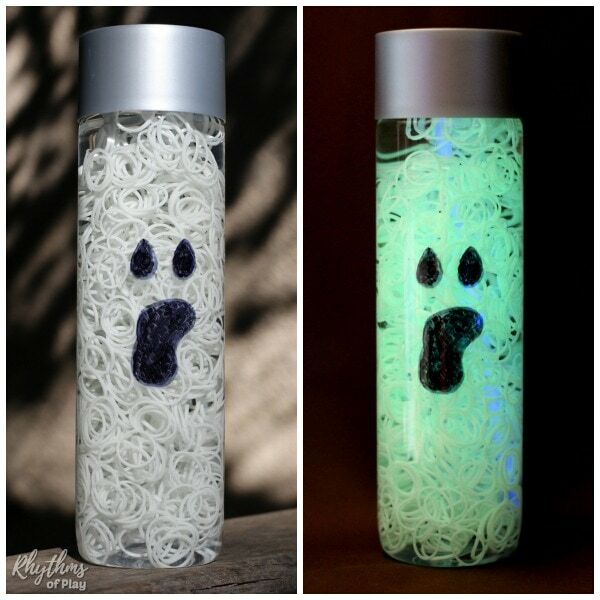 This glowing ghost Halloween sensory bottle can also be used as a luminary or lantern and Halloween decoration. 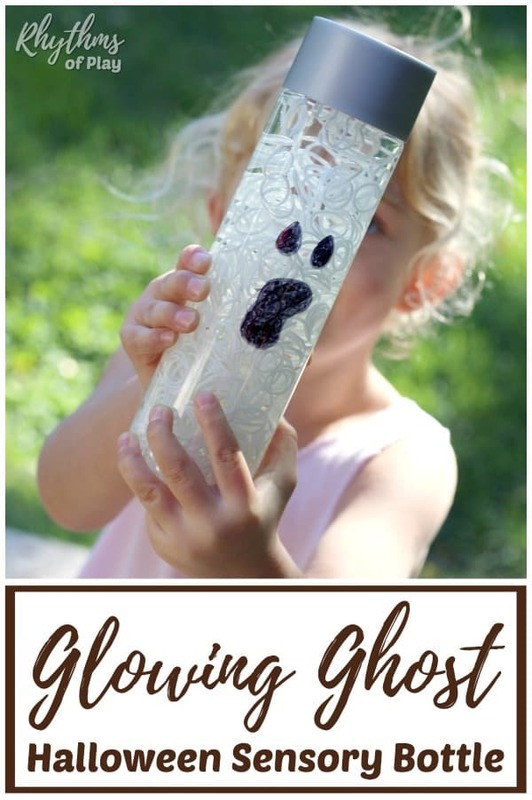 This easy DIY sensory bottle also makes a great Halloween party favor and a calm down tool for your children to scare the spooks away on Halloween night. My daughter has always loved everything about Halloween. Since the glow in the dark Halloween pumpkin sensory bottle that I made her was such a hit, I figured she would like a glowing ghost luminary too! Related: Halloween Art Projects That Kids LOVE! Sensory bottles like this DIY Halloween sensory bottle are great for calming and anxious child and for no mess safe sensory play. 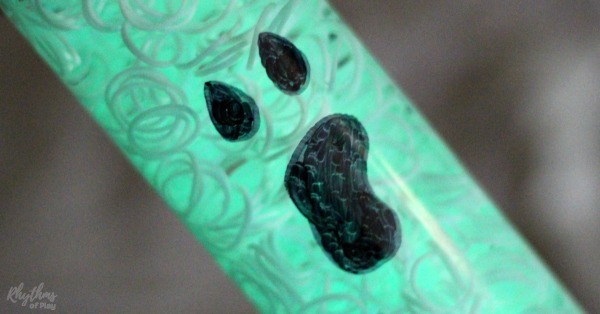 This glowing ghost sensory bottle can also be used as a Halloween luminary decoration. For more information about DIY sensory bottles and their uses check out Calm Down Sensory Bottles 101. The glow in the dark loom bands can be ‘charged’ by placing them under a regular light or out in the sun. 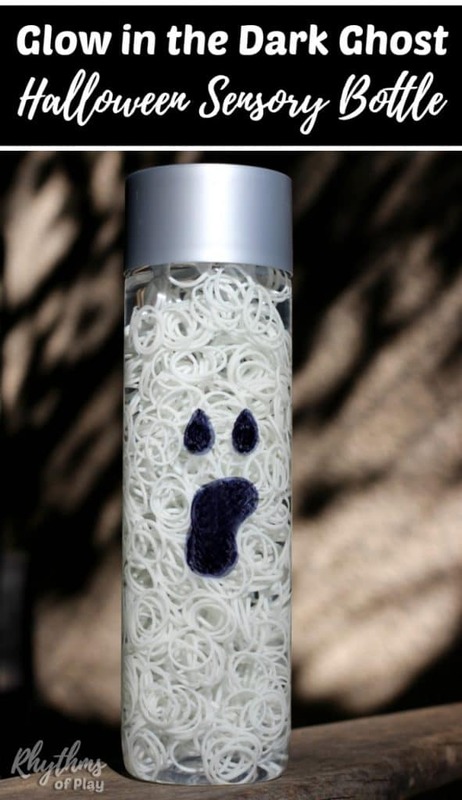 To make the glow in the dark ghost loom bands glow even brighter, use a black light or pop a glow stick into it on Halloween night. The photo on the left was taken in daylight while the photo on the right was taken in the dark with a glow in the dark bracelet in it. 1. Grab a Voss bottle out of the recycle bin. 2. Peel off sticker on the bottle. Use Goo Gone to remove sticky residue. 3. Fill Voss bottle about halfway up with water. 4. Drop white glow in the dark loom bands into your recycled bottle. We used the entire bag. Sensory bottles like these look best filled with loom bands. 5. Fill the bottle up the rest of the way with water. You want to fill it all the way to the top so there is no air in it. 6. Place the lid on the bottle. 7. Use a permanent marker to draw a simple ghost face on the outside of your Halloween ghost sensory bottle. Don’t glue it shut if you know you would like to put a white glow stick in it at some point. You could even remove the glow stick when it loses its charge so you can change it out for another one. Easy peasy. Sensory bottles like this DIY Halloween sensory bottle are great for calming and anxious child and for no mess safe sensory play. 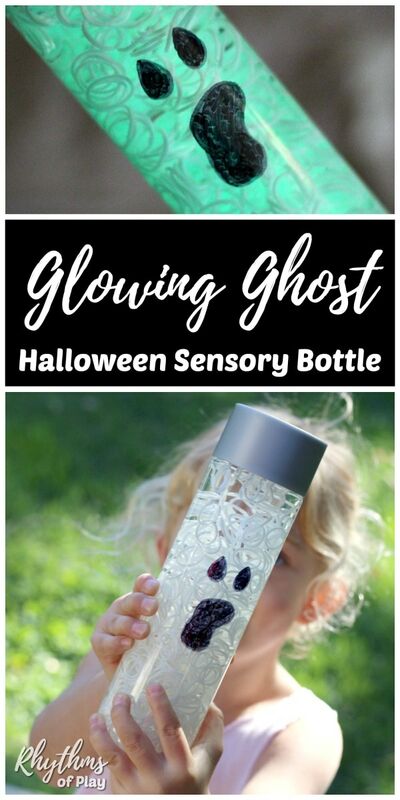 This glow in the dark ghost sensory bottle and luminary would also make great DIY Halloween decoration for Halloween parties and on Halloween night! You may also like this collection of Halloween art projects for kids. For more fun glow in the dark bottle check out this glow in the dark pumpkin, this pet fish and this super fun ringer game!